Twelve-year-old Imani Mandel was told she could have anything she wanted as her Bat Mitzvah gift. And she knows just what she wants, but she's too afraid to ask for it. Imani was adopted and now she is wondering about her biological parents and wants to know who she is and who they are. It's especially important to her since she is a young black girl and her parents are a white Jewish couple, albeit very loving parents. As part of their Bat Mitzvah preparations, everyone in Imani's hebrew school class must do a Holocaust project, an assignment she has found to be pretty uninspiring. That is until she finds the diary. Imani knew her great grandmother Anna has come to America from Luxembourg when she was young, but when the Rabbi at her funeral mentions something about her new family, Imani begins to wonder if Anna had also been adopted. Later, Imani is told that Anna had left all her books to her, her younger brother Jaime, and a younger cousin, Isabel. While sorting through the books, Imani finds the diary that Anna begun on the ship to the United States in August 1941 (and which she had conveniently translated the Luxembourgish entries into English in 1950). As she reads the diary, Imani learns about Anna's life with her twin Belle, her parents, older brother Kurt, and young siblings, Mina, Greta and Oliver, about life in Nazi-occupied Luxembourg, and, despite have sponsors in the US, about how they were forced to make a last minute when the passeur* suddenly jacked up the cost of false papers and passage, allowing only one person to travel to New York and safety instead of two. Anna was taken in by a couple, Max and Hannah, living in Bensonhurst, Brooklyn. Max was a furrier, working in the garment district for his two uncles, who has escaped the Russian pogroms as young men. Anna's first friend is a boy named Freddy, who helps her pick up English pretty quickly, teaches her the kind of street games played by kids, and even introduces her to the Coney Island Cyclone. Anna records all of this in her diary hoping to share it with Belle if and when she and the rest of her family arrive in NY. Sadly, Imani already knows that Anna's family has perished in the Holocaust, making her yearning all the more poignant. As Imani reads her diary, she decides to make Luxembourg during the Holocaust her hebrew school project with the help of Anna's diary. Using Anna's story as a way to speak to her own parents about finding out who she is seems like a good idea, but she is still too scared to talk to her parents about it. It takes a surprising discovery for Imani to finally open up about what she wants. In the end, both Anna and Imani have to learn that their identity is not necessarily jsut a matter of a biological connection, as much as it is feeling a deep connected to one's family, traditions, and history. 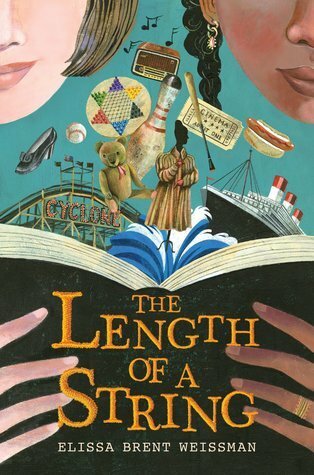 A word about the title: it is the answer to the question how long is a piece of string? and length is unknown, variable or infinite. Here, the Anna and Imani's connection to their families is unmeasurable. This was an interesting story about identity, though I felt that a little more about Imani being black could have been included with the same conclusion. Her Jewish roots were definitely privileged over her African American roots and I couldn't help but wonder what Imani sees when she looks in the mirror. Deep down inside, I also felt that, in real life, this would be an issue that will return in Imani's future. I have to agree with Ms. Yingling when she says she wished the book had followed Anna's story and Imani's had been it's own story. Both would have felt richer and more full-bodied then combining them. I did want to know more about Anna's family in Luxembourg. Did they ever receive the package that Anna and Hannah sent to them? Were they really forced into the Lodz Ghetto, as the people in shul speculated? And I wanted to know why Imani was given up for adoption. And why her adoptive mother kept the name her biological mother gave her. Weissman writes they both mean Faith, but I would have expected her Jewish mother to change it to Faith, but she didn't. I did like the fact that Weissman included enough about Imani's life so that the reader knows she is also just a kid on the verge of becoming a teen. There are tennis games (Imani is quite a good player), a best friend, other friends, parties, boys, crushes, and all the usual interests of a girl who is 12 going on 13. While some things make this novel feel a bit incomplete, which is too bad, I still think it is an important book about adoption and family and definitely recommend it to young readers. *A passeur was a person who smuggled people out of Nazi-occupied territories. They were often resistance fighters who escorted down pilots to safety, as well as Jews. Here, the impression is that the passeur isn't a very honorable person. Though some passeurs were heroes, after the war, there were also charges that some has profited from the desperation of the people they were helping to escape. It's August 1914 and World War I has just begun, and it has arrived in 12-year-old Patryk's small Polish village, within Galicia, a kingdom in eastern Europe that has seen varying occupations over its history. Presently, it is occupied by the Russian Army, who pretty much leave the villagers alone. Though Patryk and his six friends like to hang out by the village's water pump, they also have a favorite spot in the woods just outside their village. One day, while playing there, Patryk finds an old button. When his friend Jurek sees it, he demands it be given to him: "Give it. I'm king here!" (pg 5) Jurek is a rather cruel, sneaky boy, an orphan who lives in poverty with a sister that hates him, and he's a boy who has no boundaries in his craving for power. That doesn't stop him from claiming he is a descent of King Boleslaw, making the village and surrounding area rightfully his, including Patryk's found button. Soon after, Jurek shows Patryk a button from the uniform of a Russian soldier, claiming he cut it off one of the uniforms his older sister had just laundered. Jurek invites Patryk to meet him later that night so he can also get a uniform button. Later that night, they run into another friend, Raclaw, who tells them that the Russian soldiers are leaving the next day because the Germans are coming, as they take him to get his own button. Sure enough, the Russians leave and the Germans arrive and life changes for everyone in the village. And as the boys pass their buttons for the others to envy and admire, Jurek gets an idea for a contest: "Whoever gets the best buttons, wins. Winner gets to be king. Means everyone has to bow down to him. Best dare ever. Buttons." (pg 62). Only military buttons are acceptable, and no asking for a button, they have to be stolen. With the Germans come bigger, more dangerous weapons, restrictions on life for all villagers, unwelcome billeting, and very tantalizing buttons. But what begins as a typical dare soon turns dangerously serious and deadly, as Patryk realizes that Jurek will stop at nothing to get the best button and be king over them all. Patryk's plan is to get the best button so he can win and stop the deadly competition. The Button War is quite simply Avi-brilliant. Like William Golding's Lord of the Flies, it is an allegorical statement about bullies, their will to power, and the people who empower them. In its simplicity, young readers may begin to understand how power struggles, whether in the schoolyard or the world stage, can happen. In this novel, the fallacy of Patryk's thinking he can end the insanity of the contest by getting the better button fails because Jurek keeps changing the rules to the competition so that they are always in his favor, and the boys, including Patryk, continue to feed his craving for power by complying with those changes, thereby giving him the power he so desires. The setting of the story, a small village in Galicia, is unusual, but I thought it worked perfectly for what Avi was trying to say. It was a small enough place to see how war can impact the lives of people, especially children, and for witnessing the death and devastation that war, world war or button war, brings. In fact, sensitive readers may have difficulty with some of the scenes in this novel. The Button War is an action-packed, exciting coming-of-age novel. One that I found I couldn't put down once I began reading it. I only wish it has some back matter about WWI, a short history of Galicia, if for no other reason than to find out who King Boleslaw was, and a map, which is always helpful and welcome. On pages 25 and 26, the boys do discuss what country this are in and the answers give some idea of Galicia's history (which I ultimately did look up in the encyclopedia). This doesn't diminish the novel in the least, it just would have in nice to have. 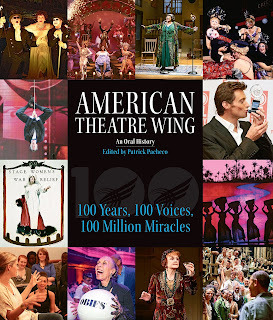 When I was at BookExpo this year, I was lucky enough to get a copy of Patrick Pacheco's new book American Theatre Wing, An Oral History: 100 Years, 100 Voices, 100 Million Miracles (yes, if you watched the Tony Awards this year, that was Patti LuPone plugging it). Quickly going through it, I noticed that Pacheco included sections on WWI and WWII. Not many people know this, but the American Theatre Wing (ATW) was very active during both wars. Shortly after the US entered WWI, the Stage Women's War Relief was founded by playwright Rachel Crothers, and 6 fellows playwrights and actresses. Run entirely by theater people, these volunteers worked hard sewing, running clothing and food collection centers, setting up and manning a canteen on Broadway for servicemen, and selling liberty bonds, among other things. And they didn't limit their work to just New York City - there were five other branches throughout the country. 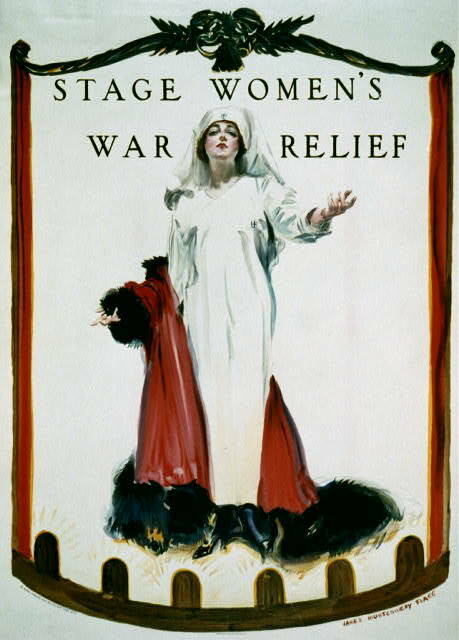 Altogether, by the end of WWI, the Stage Women's War Relief had raised almost $7,000,000 for the war effort. In 1939, even before the U.S. entered WWII in 1941, the Stage Women's War Relief was revived, organizing clothing drives and knitting for refugees in Europe, and, of course, fundraising. Once the U.S. entered the war, the name of the organization was changed to The American Theatre Wing for War Service. Beside Crothers, one of the other people who helped organize this was Antoinette Perry, for whom the Tony Awards are named). One of their most popular measures was the Stage Door Canteen. Opened in March 1942, it was staffed entirely by theater people and open to all serviceman. There was entertainment by well known performers like Frank Sinatra, the Andrew Sisters, Ethel Merman, and hostesses included such luminaries as Katherine Hepburn, Bette Davis, Helen Hayes, and ever Gypsy Rose Lee. 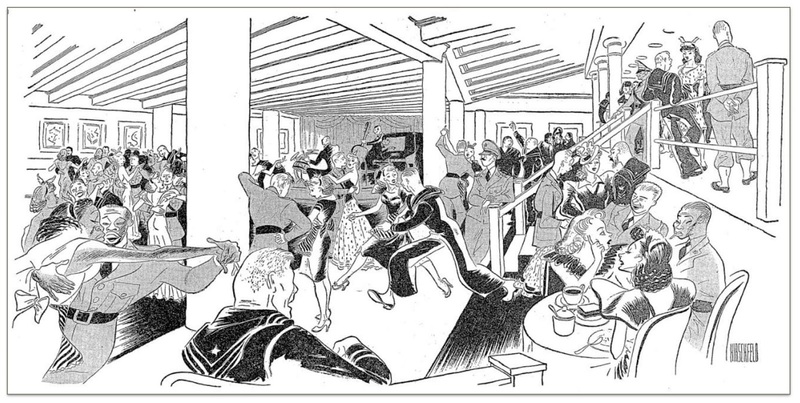 Servicemen could be served refreshments (but no alcohol), they could jitterbug the night away with Lauren Bacall, a wounded solider could find help eating by Ingrid Bergman, or they could find a shoulder to cry on if needed. 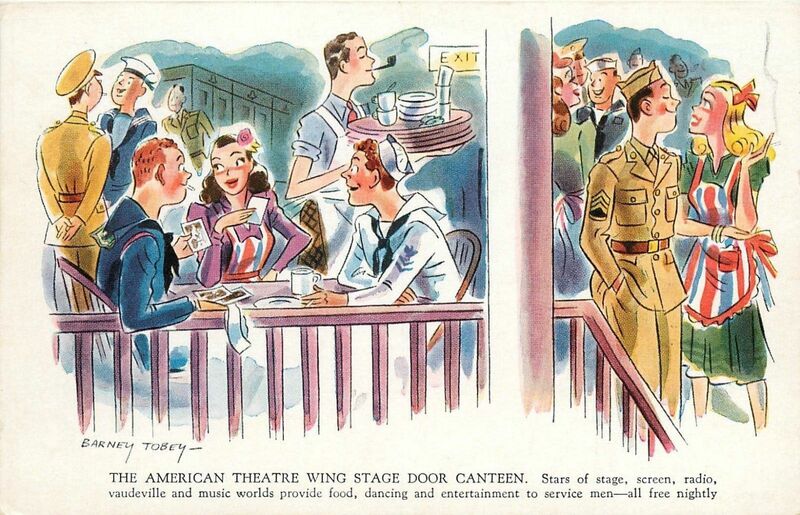 One of the best things about the Stage Door Canteen was that it wasn't segregated - everyone was welcomed. If you are a lover of live theater as I am, I can't recommend Patrick Pacheco's book American Theatre Wing, An Oral History: 100 Years, 100 Voices, 100 Million Miracles highly enough. After the bombing of Pearl Harbor and the entry of the United States into WWII, this country, the country that was fighting for freedom and democracy aboard, did a terrible thing to some of its citizens. It began when President Franklin D. Roosevelt signed Executive Order 9066 on February 19, 1942, an order that authorized the internment of over 100,000 Japanese American citizens, including men, women, and children, as well as any resident aliens from Japan. Write to Me is the story of one San Diego librarian, Clara Breed, who saw the injustice of incarcerating innocent people and whole families and tried to make it somewhat bearable for her young library patrons. Grady begins with the sad moment when young Katherine Tasaki has to return her books and relinquish her library card. Later, seeing the children she knew from the library off at the train station, Miss Breed gave out books and stamped postcards for the kids to write and let her know how and where they are and if they needed anything. Soon, the postcards Miss Breed had give out began to arrive at the library from [Santa Anita Racetrack] Arcadia, California. She began writing the kids, sending them boxes of books and more postcards. The one time she visited Santa Anita, she brought even more books. After seeing the kinds of circumstances her young friends were being subjected to and the enjoyment the books she sent gave them, Miss Breed began writing letters and magazine articles asking for libraries to be opened in the internment camps for the kids to have easier access to reading. Miss Breed continued to correspond with the kids she knew even after they were moved to the Poston Internment Camp in Poston, Arizona, in the middle of the desert. She also continued sending books, as well seeds, thread, soap, and crafts materials. Learning about the harsh desert conditions they lived with everyday, Miss Breed continued to write letters and magazine articles, hoping to make the country aware of how its citizens were being treated. 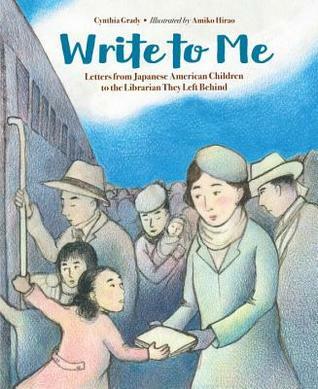 Write to Me is a picture book for older readers who are just beginning to learn about this period of American history and while it focused on Miss Breed's actions more than on the actual treatment of the Japanese American families she tried to help or the pervasive racism towards them, it does show young readers that one person can really make a difference in the lives of others. I think that's a message that will certainly resonate for them in today's world. Interestingly, the focus of each of Amiko Hirao's gently muted color pencil illustrations is reflected in the postcard excerpts sent by the children that are found on almost every page. There is extensive back matter, including an Author's Note, a recounting of Notable Dates in Clara Breed's Life, Selected History of Japanese People in the United States, a Selected Bibliography, and suggestions for Further Reading. 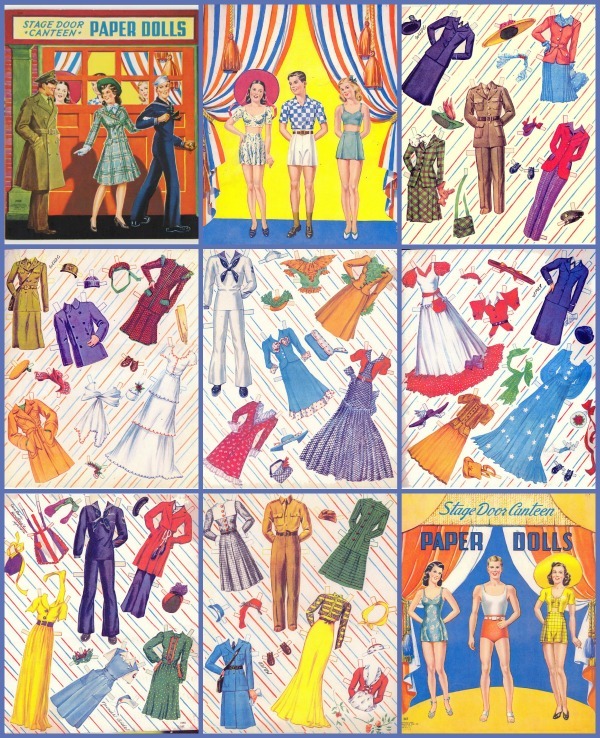 The front and back end papers contain relevant captioned photographs. Though it is for a somewhat older child, with scaffolding teachers might want to pair this with I Am An American by Jerry Stanly, for a more rounded picture of Japanese American internment camps. Clara Breed wrote another article in Jan/Feb 1945 issue of the Horn Book Magazine, which is not online but I found it in the library. The article is "Books That Build Better Racial Attitudes" and while it is really dated, I was curious to see what she recommended. One of the books is called The Moved-Outers by Florence C. Means, about the internment of a Japanese American family, and may very possibly be the first book about it. It was also a 1946 Newbery Honor book. I actually read it when I was researching my dissertation, but ultimately didn't use it, except as an example of patriotic propaganda. I'm definitely going to have to reread it one of these days. In 1929, when he was only 8 years old, Betoli was removed from his Native family and sent to the Navajo boarding school at Fort Defiance, Arizona, the very same place where Navajos had been held captive in the 1860s by the United States Army, after a forced long walk of 300 miles. At Fort Defiance, Betoli had his long, black hair cut short, was given the English name Chester, and forbidden to speak his native Navajo language. If children were caught speaking Navajo, their mouth would be washed out with yellow soap by a matron. Every year, Chester returned to his family during the summer and kept his native ways. 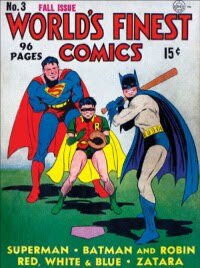 Then, in 1941, when he was in tenth grade, the United States entered World War II. In 1942, the US Marine Corps visited the Reservation. They wanted men who could speak English and Navajo to develop a code for sending messages that the Japanese codebreakers couldn't figure out. Initially, only 29 Navajos, including Chester, were chosen out of the many who volunteered, forming Platoon 382. Slowly and methodically, they first developed an alphabet, then a vocabulary of words that wouldn't have to be spelled out each time they were used. So for example, the Navajo word for whale (lo-tso) became the code word for battleship. Once a complete code was developed, it was time to test it out on the battlefield. Chester and the other Navajo code talkers in Platoon 382 were sent to the Pacific Theater, where the code they created helped to finally defeat the Japanese. Chester returned home after the war, but it had left its mark on him. His family arranged a four day long Enemy Way ceremony to help restore him to the "trail of beauty and the Right Way" so he would not have nightmares about war anymore. 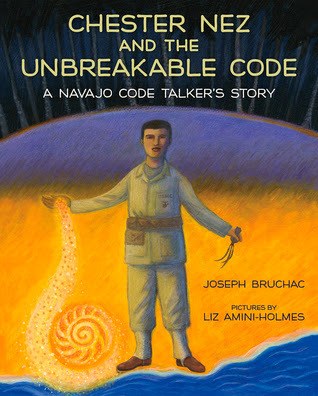 Chester Nez and the Unbreakable Code is both a wonderful introduction for young readers about the history of the code talkers and of one man's strong determination to maintain his connection to his Navajo heritage no matter what. Bruchac is very familiar with this topic, having previously published a middle grade novel about the code talkers. However, he has successfully synthesized the information about Chester Nez's experience as a Navajo child and man with the history of the Navajo code. According to the Author's Note, the hundreds of Native American who were code talkers were told to keep their work secret, even from their families, until 1968, when it was declassified and they could finally talk about the important contribution they had made during the war. But it wasn't until December 2000, when the Honoring the Navajo Code Talkers Act was enacted, that they were finally honored and awarded the medals they so rightly deserved. Liz Amini-Holmes soft-focused, richly textured illustrations are painted in a palette of mainly yellows, blues, and greens that do much to capture the relationship Nez had with his Navajo culture and home, and the pain and loneliness of being taken away to boarding school and later of fighting in the war. They are almost expressionistic in the way they express the emotions Chester must have felt rather than merely depicting the external events he lived through. Besides the Author's Note, the back matter also includes some of The Navajo Code and a timeline of Chester Nez's life. Bruchac begins each section of Chester's story with the month and year in which something occurred followed by an unfamiliar description, for example. October 1929: Month of Small Wind or September 1942: Month of Half. At first, I thought perhaps the descriptions were part of the Navajo lunar calendar, but it turns out to be the names of the month in Navajo code. That made me understand even more clearly just why the Japanese were unable to break it. I highly recommend this picture book for older readers who might be interested in WWII and/or Navajo history.